Just a tad south of the hustle and bustle of downtown Fort Lauderdale off Andrews Avenue there is a gem of a restaurant with a fantastic edible garden. This hidden gem is called Church Side 11th Street Annex, located next to Trinity Church and Trinity Churchside Garden. When Jonny Altobell and Penny Sanfilppo created their restaurant 11th street annex, one requirement of their front entryway garden was that they wanted something special. “Everything to be medicinal, edible or smell good.” According to Penny. Luckily, her boyfriend happens to be the noted BCC plant guru, and nursery owner David McLean. There are many very interesting unusual trees in the garden. There is large tree called the strawberry tree, which hails from SE Asia. There is a cinnamon tree. The cinnamon comes from the bark. There is a mulberry tree, a line berry tree and a mango tree. A large bay rum tree and lime berry tree rise up within the garden. Naturally there are plenty of fresh grown herbs. There are some unusual plants also, notably the Chinese Fisheye Jasmine. There is a tree called lolate, in the piper family. The leaves are similar to grape leaves and they can be stuffed and eaten. Located off Fort Lauderdale beach, Richard’s secret garden has a unique tropical charm. The entryway offers visitors the opportunity to sit on a swing and watch the world go by. The front yard has just enough grass to keep the dogs happy, and it’s the only grassy area on the property. The side yard has a lush tropical atmosphere with flowering hibiscus, gardenias, night blooming jasmine and more lining the edge of the property line. Hanging potted plants are decorating the slide walls of the house. This is a nice area for entertaining since the hot tub and BBQ grill are here as well. Turn the corner and here is an amazing surprise.The back garden’s main feature is a beautiful pool, with a water fall. A palm curves out and over the pool and the lush tropical garden wraps its way around the back yard giving privacy. There are palms, flowering bromeliads and a multitude of orchids hanging from the house. There are unusual art works throughout the property as well as some garden whimsy here and there. An alligator rests at the edge of the pool. A set of lions frames the front of the property. A large wood sculptured table holds a bonsai collection. What makes south Florida unique in the United States is the amazing assortment of palms we are able to grow here due to our unique climate. At Fairchild Tropical Botanic Gardens in Miami, they have collected over 700 species from all over the tropics that grow here as well. There are about 10 or so native palms from Florida. Our state palm tree is the Sable palmetto, or cabbage palm. In order for officials to pick a state tree, it had to be able to grow throughout the various temperature growing zones. North Florida is practical Georgia, so the climate is much cooler. Here in the south we can grow cold sensitive palms that would freeze there. In certain cultures, palms are dominant as a food source, housing, fiber, oil and many other uses. Here we see the fronds utilized for the roofs of tiki huts. Street vendors sell ice cold coconuts on street corners with sipping straws for cool summer refreshment. Caladiums are grown for their colorful elephant shaped leaves. The plants are started from bulbs. Now is the time to add them to your garden. Caladiums thrive during sweltering South Florida heat and provide a great colorful tropical look to your patio or garden. Wholesale growers plant the bulbs in the winter. The caladiums are ready for sale by early summer. Landscapers often switch out the heat sensitive impatiens, petunias and pansies for the heat tolerant caladiums. Visit your garden center for a bountiful selection. Caladiums are easy to grow and can be placed in partial shade to full sun. They can be transplanted to the ground or into larger size pots. Do not keep them in the containers they came in. The roots will soon become pot bound. The pot will not hold water well and the plant will decline. When repotting the caladiums make sure you untangle the root ball. Do not tear off the roots; just loosen them so they can grow out into the larger container or ground. If you leave the roots all cramped the plant will not grow as well. South Floridians love bananas and there are many to grow here. There are ice cream bananas, red banana, finger bananas finger banansas and more. In fact, there even is a nursery called Going Bananas located in Homestead, Florida. Homestead is in southwest Miami. Katie Chafin is co owner of Going bananas. When asked which her favorite banana was, she replied “Whatever is ripe!” With over ninety two different varieties to choose from, it is understandable why one would never tire of them. Here in South Florida, many people without gardens get their bananas mostly in the supermarket like everyone else does elsewhere in the country. We buy the same ones imported by the big name producers located in Central American and the Caribbean Islands. Many back yard gardeners also grow their own bananas. They are best started by shoots from the mother plant, divided up by digging the new shoots. If you have a friend with a banana you can get suckers from them, or buy plants from a local nursery. Backyard growers like to try varieties not found in stores. • Gold finger- is a disease resistant large variety. This hybrid was created in Honduras. • Nam wa- originated in Southeast Asia and has a delicious pineapple banana flavor. • Raja puri – has a superb flavor but warns Katie, “You need to feed it like a teenage boy, you can’t feed it enough.” This Indian variety requires heavy feeding for the plant to thrive. If you like this information you can subscribe to my articles on Examiner.com. 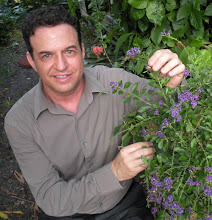 I am the Miami gardening reoporter. Its free, just click on the botton on top of the screen by my name. GIve your e mail and my articles come right to your e mail! Thank you for your support, I need subscribers. The record breaking heat would not keep hundreds of cars lined up before opening early Saturday morning. By mid day, thousands of people were piled into the normally serene Fairchild Tropical Botanic Garden. The quiet as a library environment instead was alive with sitars and tablas playing, babies and mothers giggling with delight tasting the mango ice cream. India was the theme of this year’s mango festival and the air was filled with the aroma of mango curry. Bollywood dancers performed. Yoga classes were taught for children and adult. Vendors were aplenty, featuring mango this, mango that. Rare spices were featured as well as rare teas. Free samples of Mango salsa, mango cake, and mango creampuffs were offered. Local bakers such as Joanna's Marketplace local chefs like Chef Allen were there signing books and handing out salsa. Local soap maker had mango soap, along with plenty of others. Macy’s handed out mango cannolis while promoting their catering service. A pie maker from Georgia offered samples of delicious mango pie. When walking down the sidewalk, most of the other neighbors have grass and neatly boxed high maintenance cut shrubs. Steve has a wonderful tropical English style garden. Shrubs, trees and grownd covers converge and produce an amazing symphony of color texture and depth. The backyard is a tropical paradise. There is a large fruiting mango tree, vines flowing up the palms and a wide assortment of shrubs and groundcovers as well. A stepping stone pathway meanders through the garden with a small wading pool off center acting as the focal point. There is no sprinkler system in this lush paradise; the plants have to make it on their own. Steve hand waters when he has to on occasion. Many of the plants came as cuttings and samples from friends' gardens. 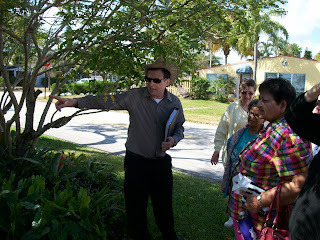 Steve is the past chair of the Parks and Public Space Committee of Miami Neighborhoods United.